How Do You Graph a Quadratic Inequality? Graphing a quadratic inequality is easier than you might think! You just need to know the steps involved! This tutorial takes you through those steps to help you understand how to graph a quadratic inequality. How Do You Solve a Quadratic Inequality by Graphing? 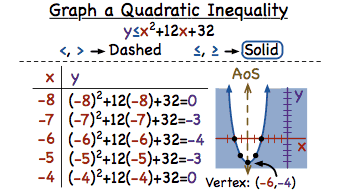 You can solve a quadratic inequality by graphing! Follow along with this tutorial to see how to graph a quadratic inequality and use that graph to find the solution!